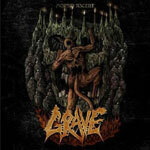 Grave is one of those bands that never seem to disappoint. While many of the once great metal bands seem to grow less inspired with every release, Grave is showing no signs of slowing down and with the release of last year's Endless Procession Of Souls they cemented their status as one of Sweden's best and most consistent metal bands. As a follow-up to that album comes Morbid Ascent, a five-song EP with two new songs, a Satyricon cover, a remix and a newly recorded version of Reality Of Life, originally from 1989's Sexual Mutilation demo. The two original songs, that is Venial Sin and Morbid Ascent, are by far the greatest appeal on this short but sweet EP. They're two school-book examples of some fine, Swedish death metal, with haunting melodies, brutal riffs and some very intense drumming from Ronnie Bergerståhl. It's remarkable how Grave always manage to sound inspired and hungry and amongst the new waves of Swedish death metal - fronted by bands such as Tribulation, Tormented, Morbus Chron and Maim - the guys in Grave really show that you can't beat this level of experience. It's an interesting mix that really gives the song a whole different feeling but it feels more like an okay bonus track than a strong addition on its own. The new recording of Reality Of Life wraps things up quite nicely and in the end I'm very satisfied with the EP, although Possessed and Epos kind of drag down the total score just a little bit. The production here is very coherent with how Endless Procession Of Souls sounded and Venial Sin and Morbid Ascent are easily on par with the best songs on that album. Hell, they're on par with some of Grave's best songs, period. I hope they get the recognition they deserve - at many times songs from EP:s tend to get deprioritized in setlists and somewhat forgotten by fans.